The Ricoh Group considers that “compliance” includes observance of not only laws and regulations, but also company rules and social ethics. Therefore, the Ricoh Group provides thorough instruction of “Ricoh Group CSR Charter”, which provides the principles of Ricoh Group's corporate behaviors, and “Ricoh Business Conduct Guidelines”, which indicates behavioral principle of directors and employees of the Ricoh Group. Every member of the Group is concerned to ensure all employees observe the principles in their daily activities. 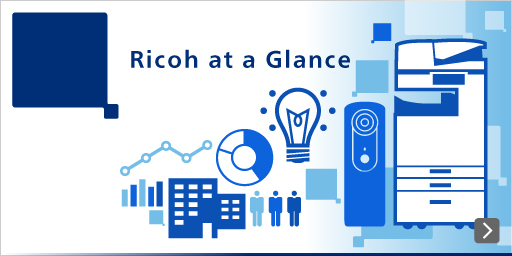 In Japan, the Ricoh Group provides all of its directors and employees with the education on the Code of Conduct via e-learning programs every year. The content of the education includes, confirmation of each provision of the Conduct Guidelines, as well as other topics relating to the enforcement of laws and regulations as priority issues with actual case examples. So far, topics such as, “Banning participation in anti-social actions”, “Limits on entertainment and gifts”, “Banning insider trading” have been featured. When the study is completed, a test to check the level of understanding of the education, a compliance awareness survey is conducted. At the end, each person sign a pledge to confirm that he or she understood and will observe the Code of Conduct. The overseas Ricoh Group companies are also providing education tailored to each country's laws and customs and the forms of local operation. Integrated internal audit (J-SOX* audit, accounting audit, business audit, etc.) is conducted for the purpose of securing credibility of financial reports, improvement of operational efficiency, confirmation of the observation of the laws and regulations, etc. The implementation of compliance within each company and each department is also verified within the integrated internal audit. Since April, 2003, the Ricoh Group has established “Ricoh Group Hotline”, which is made available to all directors, employees, part-timers and temporary staff in Japan as a contact for whistle-blowing and consultation regarding violations of compliance. Independent contact points are set up externally at the first point of contact. In any case, the numbers and addresses for exclusive lines has been set up to provide protection for the security of details of the consultation. Furthermore, a ban on unfavorable treatment of whistle-blower for the act of whistle-blowing or consultation itself, but also a ban on retaliatory actions against them have been established to protect whistle-blowers. The reception hours are being reviewed in order to make it more accessible to consult, for instance, night-time and holidays are added to regular work hours for telephone calls, and 24 hours for contact by e-mails and website. The Group standard on whistle-blowing system was established by including these details, and is now applied. The content of whistle-blowing and consultations are reported to the top management periodically, for the horizontal spread of improvement of problems and preventive measures of the Ricoh Group as a whole. In addition to “Ricoh Group Hotline”, major companies in Japan and in overseas have established their own contact for whistle-blowing and consultation according to their organizational and regional characteristics. For the purpose of confirming that business activities of the Ricoh sites comply with the 10 principles of the United Nations Global Compact, the laws, regulations and ordinances of each country and the Ricoh Business Conduct Guidelines, in fiscal 2015, the CSR Self-Assessment was conducted at three production sites in China and one site in Thailand, which are major production sites of imaging systems. As a result, we confirmed that these four sites have been executing business activities in compliance with the international norms, the laws and regulations and the Ricoh Business Conduct Guidelines. It has also been confirmed that, some CSR activities are highly evaluated by the Chinese government organizations and the three production sites in China have received remarkable commendation, especially in the categories of ‘labor practices’ and the ‘environment’. The said result shall be shared not only among these production sites in question but also across the entire Ricoh Group and contributed to our CSR driven business practice. To motivate employees to work ethically and sincerely with the right attitude while following the rules and taking responsibility for their actions, we have added ‘ethics and sincerity’ to the employee's performance rating. When an employee acts in a remarkable way, this is reflected in the evaluation. Furthermore, we translate into English and share the information on illegal matters throughout the Ricoh Group that are reported to top management. As mentioned in “Risk Management” the risks relating to violations of compliance was set up as part of the risk management items which may exert a significant influence on the group's business (operation), the risk management is carried out, with focus on preventive measures on one hand, and rapid response in the event of an outbreak of a risk on the other. “The Ricoh Business Conduct Guidelines” provides for the global basic policy and specific actions, while the Group standards and Guidelines provide for items that call for further responses. The following shows examples of responses to some of the compliance related risks. The Ricoh Group established RGS, “Ricoh Group Standard for Bribery Prevention” in compliance with “5. Limits on entertainment and gifts”, and “6. Doing business with public bodies and making political contributions”, stipulated in “Ricoh Business Conduct Guidelines”. This standard sets out procedures aimed at the prevention of acts of bribery and to ensure compliance with laws and regulations prohibiting corruption and bribery such as the US Foreign Corrupt Practices Act (FCPA) and the UK Bribery Act 2010, that are applied in any of the countries and regions in which the Ricoh Group operates business, and thus facilitates the bribery prevention of Ricoh Group companies and all of their directors and employees. At the same time, the Ricoh Group established “Ricoh Group Bribery Prevention Guidelines for Third Parties” as well, in order to prevent bribery by third parties (*) of the Ricoh Group, by informing the Ricoh Group's policy of bribery prevention. “Third Parties” refers to organizations and individuals outside of the Ricoh Group, who provide services “for the benefit of each Ricoh Group company” or “on behalf of each Ricoh Group company”. In addition to the education of the Code of Conduct, the Ricoh Group has been conducting education about bribery prevention in accordance with the necessity of each region, attempting to familiarize the problems and taking preventive measures. In the United States and United Kingdom, in order to address the US Foreign Corrupt Practices Act (FCPA) and the UK Bribery Act 2010, the policy on bribery prevention and entertainment and gifts was established respectively in 2011, and the education is being provided as well. Furthermore, in order to respond appropriately to the laws for the prevention of illegal transactions by corporations, we have been cooperating with subject matter experts such as lawyers in order to prevent any in appropriate behavior. Preventive measures are being taken, for instance, guidebooks that provide the roles of responsible departments and daily behavioral norms are established in the RGS, and articles regarding the exclusion of organized crime are incorporated in various agreements with the third parties, etc. As a company, in cooperation with the police, corporate lawyers and other external organizations, the Ricoh Group has established a framework to response timely and appropriately towards the contact from anti-social forces. Because of the fact that the Group Headquarters is located in Japan, the possibility of insider trading is higher than in other regions. Thus, in Japan, education by e-learning program is provided and specific rules are established in the RGS. In the RGS, as one of the measures to prevent insider trading with respect to the trading of stocks of listed companies of the Ricoh Group, the rule for in-advance application is established. For instance, the periods prior to stockholders' meetings or before the release of the business results, insider information is most likely to rises. Thus, these periods are designated as lock-up i.e. a closed period, for the concerned parties of the Ricoh Group, such as directors, employees, part-timers and temporary staff. The Ricoh Business Conduct Guidelines defines the basic standards by which its executives and employees are required to act when engaging in corporate activities. One basic policy in the Code stipulates that “activities shall always be based on national and regional laws, properly understood and strictly obeyed”. We also apply this principle to tax payments. In accordance with our corporate social responsibility policy we strive to maintain and improve our tax compliance and pay all taxes in accordance with national and regional laws and international rules.